In the last few days and weeks, there has been a lot said and written about Donald Trump’s presidential challenge coins. The articles have typically at least tried to take a novel and unique perspective towards their analysis of the coins and the man ostensibly behind them, but have been identical in one key manner. They have been universally negative. Vanity Fair is a little more efficient and doesn’t mince words - “THICKER, WIDER, AND MORE GOLD”: EVEN TRUMP’S CHALLENGE COINS ARE A TACKY ETHICAL NIGHTMARE”. You know what’s tacky though? CAPS LOCK. Also, while not #fakenews, this topic’s newsworthiness (Editor’s Note: terrible word) is questionable. The fact that writers, editors, and news outlets are devoting this much digital ink and time to such this topic would be surprising if it was for any president other than our 45th. As a company that makes challenge coins for hundreds, if not thousands, of clients a year, let’s get a couple of things out of the way. The design of a challenge coin is not typically used by psychologists to diagnose mental condition. Aesthetic choices, whether you agree with them or not, are not indicators of an individual’s character. Example A: Mother Theresa & Ghandi - Great people, but not lookers. Example B: Ted Bundy - Handsome, clean-cut man. Degenerate psychopath. There’s a very low likelihood that Trump had a personal hand in the design and creation of these coins. Yes, President Trump’s coins are rather ugly (and look poorly made in our eyes). This isn’t a new phenomena though! Presidential coins have been unfortunately substandard for years. They regularly get outshined by personal custom challenge coins for buck privates and by OCS challenge coins. The history of the challenge coin is great and controversial, much like our president. 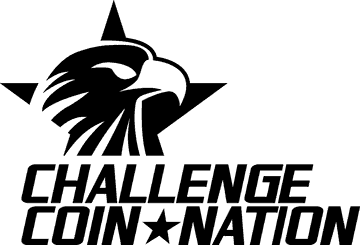 Regardless of one's political stance though, it's the belief of the staff at Challenge Coin Nation that the president of the best country in the world should have a better challenge coin, so we made it. Not wanting to get within North Korea's ICBM range of the public kerfuffle that is the funding source for presidential challenge coins, Challenge Coin Nation designed, manufactured, and delivered these free of charge to 1600 Pennsylvania Ave NW without any burden on the taxpayers. Our sole goal is to Make Challenge Coins Great Again, without any bipartisan politics. Because we’re capitalists, your piece of history can also be purchased here just in time for 4th of July! This preview will have to hold you over until we unveil the final, finished product. Sign up to receive discounts, new product releases, and see our featured coins!